A new type of construction site accident emerged this last weekend (September 9th and 10th) during Hurricane Irma, when three cranes at residential construction site buildings in South Florida—in Miami and Fort Lauderdale—collapsed. The second accident occurred in a project being built by Miami’s biggest developer, the Related Group. All three cranes cannot be secured until weather conditions improve, according to the general contractors. In addition, the city of Miami has instructed the developers to move the cranes and secure the site after the hurricane passes. However, given how there was advance notice of the hurricane, why were preventative measures not taken prior to its onset? There are more than 20 construction cranes within the city of Miami alone, prompting the city to warn residents who lived near them that the storm could bring severe danger. According to city officials, the crane’s counterweight fell through the interior of the construction site, piercing the building. People living nearby were also urged to seek refuge in their buildings and avoid the side facing the fallen crane. These cranes are designed to be able to spin in heavy winds; however, they can typically only sustain winds of up to 145 miles per hour, maximum. At the accident site in Fort Lauderdale, police reported that they had a difficult time reaching the site and assessing whether anyone was injured due to downed trees and a backlog of calls. Those in the construction industry have long fought against stricter regulations for these types of towering cranes. 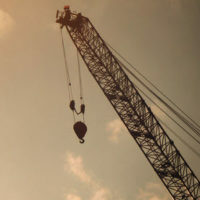 Specifically, when Miami-Dade County tried to impose a requirement that cranes be able to sustain 140 mile per hour winds, although the ordinance passed, it was eventually overturned in a legal challenge brought by the crane industry, including the Associated General Contractors of America and the Florida Crane Owners Council. They argued that regulating cranes only involved the safety of construction workers—not surrounding communities—thus federal workplace rules in place were already enough. In response, Miami-Dade pointed out that construction cranes pose an overall public-safety risk, regardless of whether you are working on site or located nearby. Given the repercussions of the first Hurricane Irma accident alone, the city should arguably consider stricter codes for the cranes, even if it comes at a cost, especially given just how many storms the region faces on a regular basis. If you have suffered an injury in a construction accident due to the negligent behavior before, during, and/or after the hurricane, we can help. At Friedland & Associates, we are able to conduct a thorough investigation into the cause of these accidents, determine who is responsible, and prove that the accident could have been prevented. Our attorneys are here to help, and serve clients in Fort Lauderdale and surrounding areas. Contact us today to find out more.